Police are investigating the theft of £11,000 worth of vaccines and medication from Lurgan Vet Clinic. 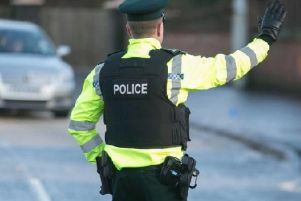 The theft happened on Friday last and was one of a number on the Banbridge Road. CCTV shows a light coloured transit pull up about 4.40am from the Waringstown direction. Less than four minutes later the thieves left towards Lurgan with over £11,000 worth of medication and vaccines. Police said two people were seen in hoods and gloves. On the same day a farm yard near the Hall Road junction was targeted. A generator, angle grinder and a rotavator were stolen. The generator took at least two people to carry. The road works at the Hall Road were also hit. A rock breaker digger attachment, a vibrating plate, and a digger grab were all taken. The rock breaker is said to weigh about 400kg so police suspect it would have taken a ‘gang effort’ to lift it. They also asked anyone offered any of the stolen items, or see similar on offer, to call police.